Rules of Engagement – A Conversation & Invitation to Move Prospects Beyond Social Media. This week on Free Webinar Wednesdays, Eric and Jeff uncover the "rules of engagement" with Business Coach and Mentor, Louise Crooks (Keys to Clarity), as she shares what it takes to create engagement on social media platforms like Facebook, Twitter and online radio (Blogtalkradio). As you seek to build quality relationships online, engagement really means taking it beyond just becoming ‘friends’ or ‘fans’ and takes it to a whole new level of interaction that turns prospects into clients. She’ll share tips on how to engage, how to build a relationship with a prospective client on these mediums and how to invite them to move beyond that initial interaction so ultimately they become a paying client. As you know, we all prefer to do busienss with we know, like and trust... and this week's session will help to share some ways to make that happen online. Don't forget to stop over to Faebook and search for the group "How to Grow Your Conscious Business on Facebook" (just type it in to the search box). This is a private group, but Louise has offered to accept FWW folks, so be sure to mention that in your request. You can also "fan" her page at www.facebook.com/keystoclarity. So Why Tell Stories, rather than just blather on in plain ordinary language? 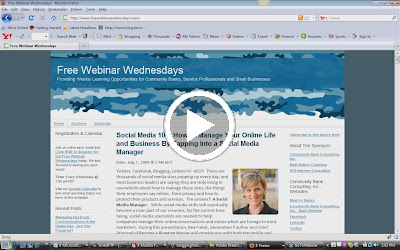 Annie Hart, master communicator and story teller will be our guest in this edition of FreeWebinarWednesdays.com. So why should we tell stories rather than speak in plain old ordinary language? For many reasons. First of all because telling stories is more fun and we should always have fun when we’re speaking. Storytelling is the oldest and most powerful form of communication on the planet. It completely bypasses the rational conscious mind and goes directly into our unconscious, which is the meaning maker of our mind. This means that stories go in more easily and are more enduring than ordinary communication. If you want to have power in your message, you really need to tell a story. Words by themselves are completely boring. They are just like flat pieces of cardboard with no color on them. To make a mosaic out of them you need to create colorful images in your reader or listener’s minds eye. So I went out on the street the other day and as stepped out the door, I smelled the taste of roses in my mind. Now what does that mean? Absolutely nothing. But notice that it created clear images in your mind. Your brain needed to visualize the step, the door, the smell, the taste and roses, all in one short sentence. This is the same way a great story is created, from inside of the memory banks of your mind. We need to tell stories for many reasons but the most important of which is that you don’t want to be boring with your words. Most of all tell stories because they are the most fun and enjoyable way to communicate on the planet. That’s it, enough said. Now go tell a story. Annie Hart – Master story teller, Book Yourself Solid Certified Coach and author of the blog Stories Change the World: Inspiring change through story. Visit her blog at http://anniehart.com/blog/. Click here to read a biography of Annie Hart. Please see "comments" at the bottom of this post for additional resources. Also please leave feedback, questions, etc. using the comments feature. Twitter, Facebook, Blogging, Linked-In! HELP! There are thousands of social media sites popping up every day, and most business leaders are saying they are truly living in overwhelm about how to manage these sites, the things their employees say online, their privacy and how to protect their products and services. The answer? A Social Media Manager. While social media skills will eventually become a main part of our resumes, for the current time being, social media specialists are needed to help companies manage their online conversations and duties which are foreign to most marketers. During this presentation, Bea Fields, Generation Y author and Chief Principal of Become a Blogging Maniac will provide you with both the profile and the guidelines needed to bring this very specialized individual to your team. Learn more about Bea Fields, her work, her websites and her blogs. Click here to view Bea Fields biography. Free Webinar Wednesdays was created as a community building tool to bring professionals together to share pertinent business development information, provide subject matter experts with a platform to open a learning dialogue, and inspire small business owners to reach their professional goals. Free Webinar Wednesdays is sponsored by Community Bank Consulting, Inc.,WSI Internet Consulting, and Matt Walker Coaching. BlogTalk Radio 101 - An Introduction to this Free Publicity Powerhouse! Join us for a discussion with Louise Crooks about BlogTalk Radio. 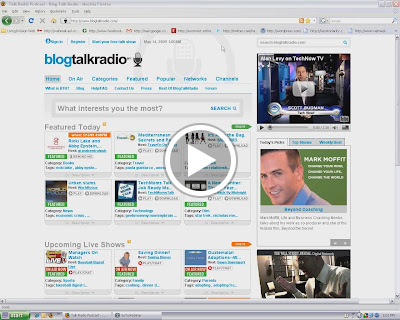 BlogTalk Radio is a very popular free internet radio service enjoyed by millions from around the world. Louise hosts a weekly BlogTalk Radio program entitled KeystoClarity! Coach. BlogTalk Radio offers an opportunity for your audience to listen live as the show is being recorded and dial-in to participate in the discussion, they can also use iTunes to have their favorite shows downloaded automatically to their computer as a podcast. Louise will tell us the basics of setting up a BlogTalk Radio Show. She will also discuss the advantages of using tools like BlogTalk Radio to promote yourself. She will discuss tools available for promoting a BlogTalk Radio show. Please join in on the discussion of this vaulable and free promotion tool! To learn more about Louise Crooks, click here to access her biography.